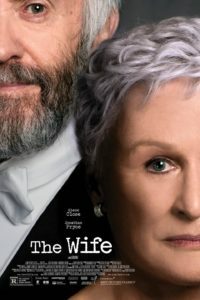 The Wife, based upon Meg Wolitzer’s bestselling novel by the same name, opens with a sixty-something affluent couple, Joan Castleman (Glenn Close) and her husband, Joe (Jonathan Pryce), waiting for the phone to ring in the middle of the night. A perhaps futile hope that the Nobel Prize committee will grant Joe his dream of a lifetime–the Nobel Prize in literature. Like two kids, Joan and Joe jump on the bed, ecstatically holding hands, singing “I won the Nobel.” Or was that a “we?” It is 1992 and Joe and Joan Castleman’s lives are about to be changed irrevocably. A raw unfolding of secrets, infidelity, resentment, self-sacrifice, delusion, and rage erupt from the couple’s souls and that of their son, who is reminded by his father that he is merely a shadow of his own greatness. What a wonderful homage to father-son, and to husband-wife! The complexities of their relationships reveal a whirlwind of bliss and toxicity (not unlike Ingmar Bergman’s classic “Scenes from a Marriage”.) Contradictory emotions can coexist in a marriage: warm and playfully tender, or dark and destructive. The Wife is, first and foremost, about the wife who stands by her man, often as a character alibi: ‘My husband is a good person in spite of what I know.’ But what happens when the secrets twist around like snakes: the talent is not where the husband thinks it should be? And the wife feels compelled to prop him up. Enter Nathaniel Bone (played perfectly by Christian Slater,) an ambitious young writer who wants to dig deep into the enigmatic life of Joe Castleman. He’s done his research and speculates that there is considerable backstory to Joe Castleman’s literary success. In a series of lengthy flashbacks of the younger Joe and Joan (played by Annie Stark, Glenn Close’s daughter), their early years of marriage promised their lives would be content and fulfilling. On the other hand, Nathaniel suspects that Joan was a king maker in ways she hasn’t revealed. The Wife delicately yet powerfully eviscerates the vulnerability of the narcissistic male ego and how it destroys all those nearby. The son suspects he knows the family hellscape. Glenn Close’s almost supernaturally subtle, superbly self-controlled face in close-up says it all, communicating emotion and intention: resignation, understanding, sacrifice, love, and not-quite imperceptible rage transforming and flickering in and out in mere seconds. This is acting at its finest. The Wife is one of the best films of 2018 and offers viewers a chance to observe one of the finest performances Glenn Close has ever given. I predict she will be nominated for an Academy Award for this role. Note: Currently playing in theaters. Looking forward to this movie. Your review just confirms it!